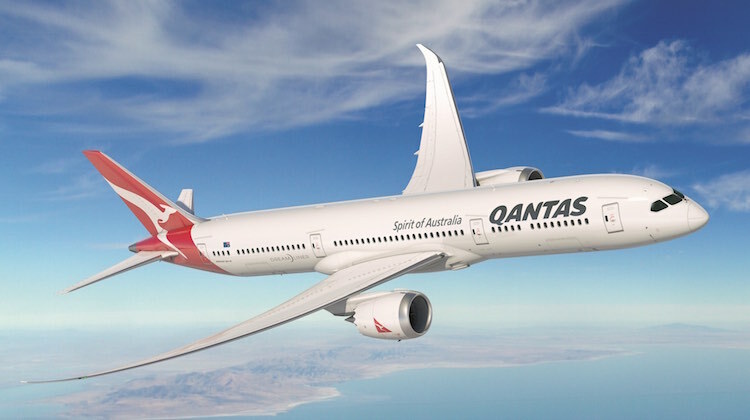 Qantas has used its annual results announcement to reveal a few more tantalising details of its planned introduction of the Boeing 787-9 Dreamliner into service next year. The 787’s arrival is “about 15 months” away, Qantas chief executive Alan Joyce told journalists at the company’s full year results presentation on Wednesday, where he handed down a record profit for 2015/16. Joyce also confirmed that the first of eight 787-9s on firm order will be deployed on existing routes before the next-generation aircraft is used to expand the airline’s international network. In the meantime, Qantas says it is well advanced in planning for the aircraft’s induction into service, with new “luxury suites in business class” and a “revolutionary premium economy that is streets ahead of anything else out there”, Joyce promised, without further elaborating. Further, negotiations with airports and state governments are continuing as Qantas narrows down the list of potential new routes for the aircraft, with Joyce again confirming routes such as Perth-London and Melbourne and Brisbane to Dallas/Fort Worth, among others, are under consideration. Tickets sales for the first 787 services will be on sale by Christmas, with confirmation of which new destinations the aircraft will serve for Qantas to be announced “shortly after that”. This suggests the cabin configuration – what type of and how many seats will be in each of business, premium economy and economy – will be made before the end of the year. “The Dreamliner doesn’t just extend our range – it also changes what’s possible for out customers,” Joyce said. “We’re working with a range of specialists to create the best Dreamliner experience on the market – from a team of world-leading designers, including Marc Newson, to university sleep experts. The four 787-9s due to arrive in the 2017/18 financial year, and four more in 2018/19, represent the only firm aircraft orders for the Qantas mainline fleet in the immediate future. The airline group is due to take delivery of six aircraft in 2016/17, comprising three Fokker 100s for its fly-in/fly-out and charter operator Network Aviation (which operates under the QantasLink brand) as well as two Airbus A321 narrowbodies to be added to Jetstar’s Australian domestic fleet via operating leases and one Boeing 737-400F freighter for Qantas Freight. Beyond the current year, the first of 99 A320neo Family aircraft powered by LEAP-1A engines are also due to start arriving from the end of calendar 2017. The aircraft are ostensibly destined for Jetstar as older A320s are paid off and to cover growth, although the company has not ruled out operating the aircraft on Qantas mainline domestic services to replace its Boeing 737-800 fleet. Qantas group chief financial officer Tino La Spina told analysts during the company’s investor presentation the A320neo promised a 14 per cent fuel burn advantage over the current generation A320ceo. Looking further ahead, Qantas also holds 15 remaining options, which have firm delivery dates and a fixed price, and 30 remaining purchase rights, which have a fixed price but no firm delivery date, for the 787 family that have to be exercised between now and 2024/25. Joyce said Qantas would look to “bed down” the first eight 787-9s into the airline’s operations ahead of any move to add more Dreamliners to the fleet. “It will make our international business even more resilient than it is today. Making money with the Dreamliner is something Jetstar, which has 11 787-8s in service for its long-haul international network, already seems to be doing, with an investor presentation released as part of the results announcement noting that the “new B787-8 fleet [is] contributing to [a] 10 per cent ex-fuel unit cost improvement”. Jetstar used the 11 787s to replace 13 A330-200s, which were in turn inducted into the Qantas mainline fleet. I hope the aircraft QF purchase have better reliability than those operated by jetstar. 9 across will be torture for anything over 8 hrs. They will only have a different product if they stick with the 8 a cross it was designed with. BUT here is an opportunity for QANTAS to fly into Berlin via Dubai as a service that Emirates doesn’t have permission to do. It would be great to see QANTAS return to an all year schedule back to YVR. Five years after its first commercial flight and with 445 active airliners in service, the 787 is not exactly a plane that needs to be teased into the market for the next 15 months! Strangely enough, it’s almost exactly 4 years ago that the news was about Qantas cancelling its original 787 order. Perhaps they are using the same marketing plan from 4 years ago lol! Joycie come lately’s slow reveal will see more than 560 78’s already flying when type comes to market. Great profit shame about the journey. @Luke and @Peter – to be fair you have to remember however that the B787 story 4 years ago was about uncontrolled battery issues, and safety/serviceability issues surrounding that. Even if the aircraft was saving fuel when compared to other older types, it was keeping more than a few travelers (and airline execs most likely) somewhat nervous through voluminous media coverage, and was probably underperforming in terms of load factors as a result. Whilst I think giving the LCC Jetstar first crack at the B787 probably robbed QF mainline of fuel savings and the kudos, the QF international arm was pretty fragile at the time, and probably less well placed to be experimenting with a new type. At least QF international can introduce the type off the back of lessons-learned by Jetstar (and the rest of the global fleet). Admittedly that’s not the pioneering spirit that QF had developed over the years (think double sunrise club in WW2; early buying of the bespoke short-fuselage B707-138 based on requirements around the Nadi runway hump; first round the world jet service via LA, NY and London etc) – but in those days the airlines had a cadre of company engineers embedded with the aircraft manufacturers – and the measurement of risk (operational and commercial) was considerably different. Now doubt QF international should look to expand its B787 fleet quickly if it is commercially successful and the finances make sense. At the very least it will go someway to ameliorating the poor non-decision regarding B777 all those years ago. Interesting how Luke and Peter have a crack at Qantas group about the roll out of the 787s they ordered, and random has one about the 777. Pretty sure this result should put all the decisions QF have made over the past 5 years to bed. 787 was better value driving down JQ costs, kinda makes sense at JQ is a low cost airline. Good work QF, look forward to the 787. Your idea with B777 being a wrong fit seems to only focus on the high density routes LAX / LHR – surely there are routes like Frankfurt, Athens, Rome, Mexico City, Vancouver, Jo’burg etc that might have done well out of a ultra long range twin-engine aircraft somewhat smaller than B744 – and would have preserved a more diverse and cost effective route structure for Qantas International. I get your point that Qantas is doing well now which is excellent – but they may not have had to dip as much in previous years if some other choices had been made along the way (such as fleet decisions). Surely there’s nothing wrong with acknowledging / saying that. I seem to remember an interview with Geoff Dixon by Geoffrey Thomas (I think) for Aus Aviation and when asked about the B777, Geoff Dixon stated that they couldn’t make the business case for the investment. (Perhaps Jordan can provide a link to that interview). A lot is said about the extra fuel the old B744s’ burn in comparison to the two engined alternatives. I think it was Alan Joyce who said this year that with the cost of fuel where it is, the cost advantage in fuel saving by using 2 engined aircraft is lost when taking into account the other operating costs. This was one of the reasons that the decision was made to keep 11 flying instead of reducing down to 9. I think all the B744 are now fully depreciated and paid for so from a business perspective they don’t owe the company any money and so it is just the cost of operating the aircraft. Of course if fuel increases to the levels it was a few years ago, then it will be a different scenario. It seems strange that so many other “comparible” airlines managed to make the case for large long-range twins in the past 15 years but not Qantas. Granted that no two airlines are the same, but surely Qantas isn’t playing with such completely unique circumstances as to render them a “pariah” within the airline community with respect to fleet management. There are several international airlines that have managed to work large long-range twins into their fleets, and several that have done it with A380 as the flagship and a depreciated (and eventually divested) fleet of B744. Dixon may well have said that it didn’t stack up – but having said that other airlines obviously made it work in that period, and certainly reaped a reward from twins when fuel prices soared. There is the possibility that it may not have worked in the eyes of QF management because planning at QF was so heavily concentrated on sustaining it’s premium flagship routes (LHR / LAX), and quite possibly to the detriment of secondary markets. Those services to ‘other’ outposts (Rome, India, Athens, Mexico City for example) gradually eroded – and these markets that would have given QF a better route network on which to spread commerical, social and political risk. These smaller markets were/are well suited to B777/B787 (either because they allowed higher frequencies, or smaller pax numbers with better load factors). Given the path they have charted over the years under Dixon and Joyce then perhaps the subsequent fleet decisions were the natural and justifiable course (eg delaying B787 into QF and commencing it with JQ) – but it doesn’t necessarily make the original fleet decisions (or non-decisions) of 15-20 years ago correct. 1. Qantas does its own computer modeling on aircraft life costs etc from what I understand. The model is built to simulate Qantas’ operations. 2. The major 777 operators in the Middle East and Asia are hub operators where Qantas is an end of the line airline. Having said that, it would be interesting to compare the modelling done by Air New Zealand and that of Qantas. 3. On what grounds are you basing your assertion that Qantas is a pariah with respect to fleet management? My wife complains of 9 across after 8 hrs too. So we settled on 2 or 3 minutes. Well its official as I predicted QANTAS will receive its first 787-9 with airframe 616 That Airframe is due to QANTAS with QANTAS taking delivery on 27th September 2017 i.e. 13 months from now. Pity so many other airlines are getting the benefit of this fantastic aircraft in the meantime. what about a weekly SYD/Vail or SYD/Den flight in northern winter ? Perth passengers apart from enjoying a one stop flight to Berlin would be able to connect in Dubai to the double daily Qantas A380 flights to LHR. Passengers from Sydney & Melbourne would have a daily one stop flight to Berlin as would customers boarding the Emirates code share flights from both Adelaide & Brisbane. Furthermore Emirates do not have traffic rights from Dubai to Berlin & could pride feed via a codeshare & Qantas would also have full 5thfreedom rights on this potentially lucrative sector. I fully support the prospect of a non stop PER/LHR service but consider aPER to Berlin flight to be equally compelling. I only hope something is done about the screaming flap motors. The noise prior to takeoff is uncomfortably loud for those sitting over the trailing edge of the wing.. As far as comfort for cattle class is concerned give me the 380 any time. The 787 is a bust except for help in reducing jet lag, just another Boeing big beast!!! Don’t want to be picky, but the QANTAS round the world flights went via San Fransisco, not via LAX. Flights to Los Angeles didn’t start until the late 1970s, long after the round the world flights had been suspended.